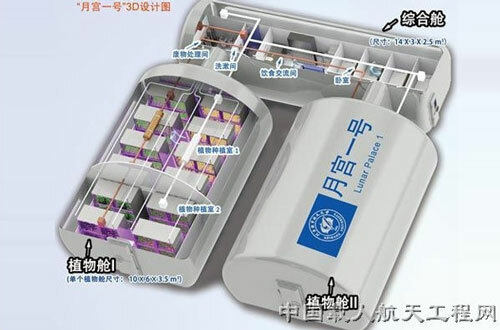 (Nanowerk News) China is a step closer to setting up a lunar base after a 105-day manned airtight test, in which the bio-regenerative life support systems of Lunar Palace 1 sustained the lives of three trial volunteers. The three "moon dwellers" drank recycled purified water, ate worms and food they grew themselves, conducted experiments, and chatted with their family on the Internet in the enclosed capsule from February 3 to May 20. The full title of the project is Integrative Experimental Facility "Lunar Palace 1" for Permanent Astrobase Life-support Artificial Closed Ecosystem Research, in short, Lunar Palace 1, a royal residence for the moon. Lunar Palace 1 comprised a 58-square-meter vegetation cabin and a 42-square-meter living cabin with three bedrooms, a dining room, a bathroom, and a waste disposal room. Scientists selected food that could provide enough nutrition for the three post-1980s volunteers: five cereals, including wheat, soybeans and peanuts; 15 vegetables, including carrots, cucumbers, and water spinach; and the only fruit, strawberries. Wheat is not only the main energy source, but also the oxygen provider in the capsule which enabled the oxygen to be regenerated three times during the 105 days. Fifty-five percent of the food for the three volunteers was generated inside the bio-system, while the rest, mostly meat, was externally produced. But the capsule inhabitants also raised and ate yellow mealworms, their main source of protein. The debut of these worms at the IAA Humans in Space Symposium in 2011 shocked peers from the U.S., but some said they tasted like French fries after they trying them. Lunar Palace 1 is different from Biosphere 2, an Earth systems science research facility in the U.S., says chief designer and lead scientist Liu Hong, a professor with the Beihang University. "Biosphere 2 is a duplication of the living environment on Earth, which is a failure we did not want to repeat," says Liu. "The system we made was directed towards the needs of humans. We carefully chose what plants, animals, and micro-organisms would be best included in the ecosystem." Although the U.S., Russia, and some European countries have been working on specific related technologies, they've conducted no large-scale system experiments in recent years. "Many foreign experts think building a space base cannot be achieved in the near future, so they do not put many resources into research in this field," says Liu. But the length of time needed to understand the complexity of an eco-system is why scientists should start experimenting now. Lunar Palace 1 does not perfectly mirror the environment on the moon. The low gravity and high radiation are not factored into the capsule; and scientists do not know how these would affect the ecosystem. The experiment results were better than expected, but there is still room for improvement. "The system is only mature when it can be run for a long time," she says. "Then we can be confident of using it in outer space."